When a new year comes, some people like to choose a word for themselves that will frame the year ahead. I have never been one to be so proactive and seek a “word of the year” for myself, but this year the word found me. Now, I have often used the word as a way to describe how the actions we take cause effects, etc., but sometimes when a word is placed in a certain context, it just jumps off the page and changes you. It made me think about how I wanted to be more mindful of life’s ripples. Both the ripples that I create with my actions, and the ripples that touch me through others’ actions. It made me think and feel. Interestingly enough, Suzanne and I became friends through someone else’s ripple effect. Our mutual friend Kathleen connected us, and though Kathleen has found her way Home, her touch continues to ripple into the lives of many, many people. Kathleen left ripples that, like Jake, will continue forever. 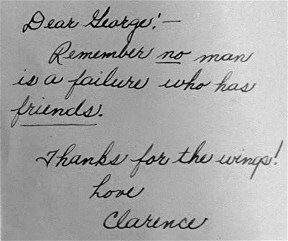 The film It’s a Wonderful Life has made its way into several of my posts, and I love it dearly. I think one of the many reasons it is my favorite movie is that from a very young age it helped me understand the power of ripples. If George Bailey had never been born, life would have been drastically different for many people—people he never understood he had an effect on because the ripples of life undulate long past our immediate surroundings. And so, in 2014, my guiding word is ripples. What am I doing that is putting in motion ripples of kindness and compassion? What should I think twice about because it might ripple on in a way that could cause hurt? What will I do with my days that will reach out and leave someone feeling a little bit better about life? My words and actions matter. And so I will be even more thankful for the ripples of kindness shown to me. The sweet words from a friend who wants me to know I count. The way it feels when someone actually listens if I risk going beyond “I’m fine” when they ask how I am. I will cherish the people in my life who truly connect with me in both giving and receiving—where it’s not just a one-way street that can leave me feeling as though I am the only one who cares. I won’t forget how it felt when a friend and coworker made a meal for my family when my mom was in the hospital or the words of concern and care from another even though her own life is tossed on its head. So often we can leave positive ripples by just being present and showing someone that they matter. And then what? How might that ripple continue on? We all know of stories about how someone offered care at a moment that, unbeknownst to them, was the breaking point for the other person, and the help came at a critical turning point. We simply do not know all that others are dealing with. Our simple acts of kindness might leave more of an impact than we could have ever known. A very dear friend of mine was a teacher for thirty years. She is one of the most caring people I’ve ever known. I can’t imagine how far her ripple extends in the lives she has touched both in and out of the classroom. I truly believe that for generations to come, her impact will be felt. She is just one example of those I know who, if Clarence came down and showed them how the world would be without them, it would be a much sadder place. Ripples…big or small…they extend out to the world. Who knows how far those ripples will undulate or where they might reach, but they matter. ALL PHOTOS ARE MY OWN OR USED WITH PERMISSION. PLEASE NOTE THAT THERE MAY BE ADVERTISEMENTS BELOW VIA WORDPRESS.COM. THE PRESENCE OF THESE ADS DOES NOT CONSTITUTE ENDORSEMENT OF THE INFORMATION, SERVICES, OR PRODUCTS FOUND IN THEM. Thank you for this article, Lisa. Its ripples have affected me. And I will live a more mindful life–if only for a day. Thank you, Leanne! I appreciate your kindness! to suffer to this day. have connected two of her friends. LOVE it. Thank you for your ripples. I love the word you have chosen it very authentic and genuine! It matches your smiling spirit within. Thanks for sharing and also visiting Lisa! Have a wonderful day ahead! Thank you, Wendell! You, too, have a wonderful day! It's time to follow the Juggle Struggle. Enter your email address to have the Juggle Struggle sent right to your inbox! © Lisa Ancona-Roach and The Juggle Struggle, 2012-2018. Unauthorized use and/or duplication of this material without express and written permission from Lisa Ancona-Roach is strictly prohibited and subject to the copyright laws of the United States and other international copyright law. Excerpts and links may be used, provided that full and clear credit is given to Lisa Ancona-Roach and The Juggle Struggle with appropriate and specific direction to the original content. Writer. Blogger. Storyteller. Juggle Struggler. Cynical Optimist. Work in progress.